Plucky inventor and aspiring hero Jet Chow was ten when the world (as we know it) ended in a flood of shuffling undead bodies. The zombie plague ceased with the dispersal of a cure, but society collapsed, and humanity became an endangered species. Orphaned in the disaster, Jet survived for over three years in a prepper’s off-grid shelter in a Wichita backyard. When his resources run out, he is forced into a quest for food and shelter, which turns into a search for the rumored last outpost of humanity: Echo Falls. First I want to thank Teresa for doing the interview with me. Read the interview below and found how intriguing she is. 1. What is your writing process? Usually I come up with many concepts in a short period of time, briefly develop them and write down a short one page (sometimes two) synopsis. From that, I begin writing. Many times a story will unfold as I go along; a process that I love because I become so involved with the characters and their life. 4. What is your latest news? 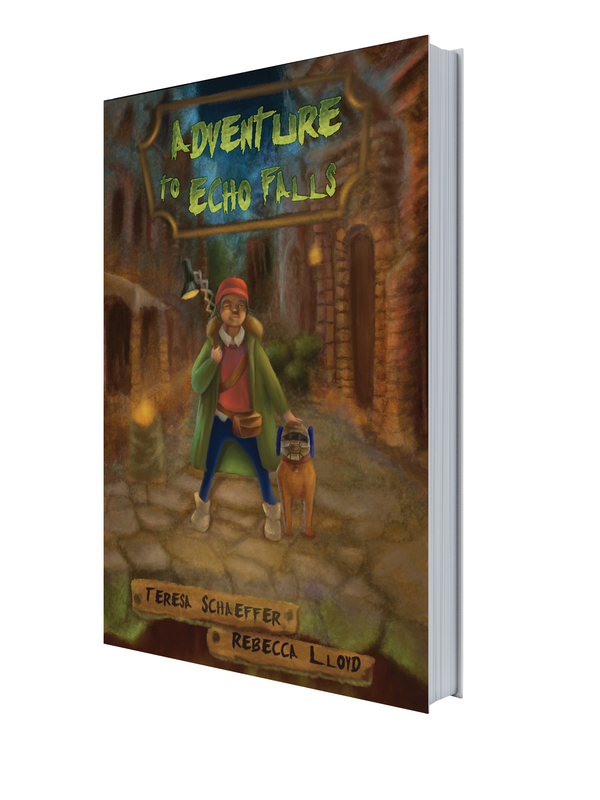 “Adventure to Echo Falls” is book one of a ten book series—a series that I have coined “Books for a Cure”. Books for a Cure is about raising awareness about the degenerative brain disease, CJD, and I will be donating 5-10% of proceeds to the CJD Foundation (www.cjdfoundation.org) on a monthly basis. Jet’s adventures will continue with book two, “Watchmen of Echo Falls” – releasing just in time for Halloween! 5. What are the five things people do not know about you? I have four other published books, two of which are published through Ransom, The Questions Within and A Forgotten Tomorrow. I’m a big time animal lover and activist. 6. What genre do you write? Mainly thrillers, dystopian fiction, horror and sci-fi—or a combination. 8. How do you come up with characters for Adventure to Echo Falls ? Actually, I first created the characters as part of an animated series inspired by “The Goonies” and “The Walking Dead”—a comedy I was developing called “30 Echo”. While pitching our animated series “Lemmon Glass” (www.killer-alien.com) I had the bright idea to turn Jet’s (protagonist) adventures into more of a middle school story—and here we are with more than five books written and lots of adventures to come. 9. What are your favorite characters in Adventure to Echo Falls and Why? Jet and his cyberdog, Baxter. Jet is a loveable character—he is a klutz who only wants to make his father proud. He dreams of becoming one of Echo Falls’ Watchmen…a hero. I think a lot of kids will be able to relate to his character and his journey, overcoming obstacles and staying determined, no matter what. The underdog doesn’t necessarily stay the underdog—something I completely relate to. 11. How many books do you read a year? Tons. 15. How long did it take for you to write Adventure to Echo Falls? 3-4 weeks. Regardless of what I’m writing, I try to write at least 2k words per day. 16. Do you have any children or pets? If so, do they distract you, or assist you with writing? I have three cats and a dog, and they are the BEST writing companions! 18. Do you have a day job, you would be comfortable sharing? Do you have any good stories about your day job, you would like to share? I’m an independent film producer and screenwriter, who also happens to be a ghostwriter and content marketer for a variety of clients. I used to work in group homes for the developmentally disabled as well as nursing homes—LOTS of inspiration here. 20. What are your next writing projects? I’m working on a few concepts for film, a novel (which will be released under the name Ezra Gray) and getting 30 Echo off the ground! 21. What are your writing or publishing goals in the future? I’m producing my first feature film this year, “One Not Taken” with two of the BEST producing partners, Danny Rhodes and Lisa Cisneros under our company banner Rhodesclosed Productions. Getting this movie made is a MAJOR focus of mine as well as getting the entire series of “30 Echo” released over the course of the next year. I honestly want to raise as much awareness about CJD as possible—a disease that is “one in a million”—through my publishing endeavors. This entry was posted in Author, Author interview, Blog Tour, Writer and tagged Author, author interview, books, Children's book, Writing. Bookmark the permalink.